Buyenlarge Thurston The Great Magician: Do The Spirits Come Back? - Gallery Wrapped 24"X36" canvas Print., 24" X 36""
Do the spirits come Thurston the great magician the wonder show of the universe. 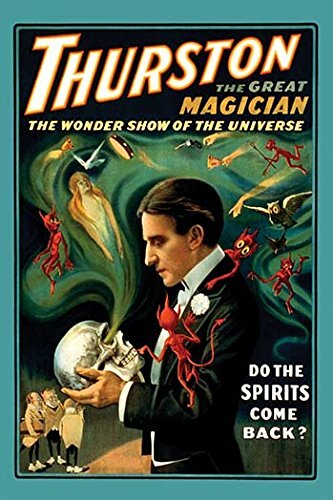 Howard Thurston (July 20, 1869 - April 13, 1936) was a stage magician from Columbus, Ohio, United States. Thurston's traveling magic show was the biggest one of all; it was so large that it needed eight train cars to transport his road show. If you have any questions about this product by Buyenlarge, contact us by completing and submitting the form below. If you are looking for a specif part number, please include it with your message. DecorArts - Cafe Terrace At Night, Vincent Van Gogh Art Reproduction. giclee prints Framed Art for Wall Decor. Framed size: 36x30"
Buyenlarge 0-587-23257-9-C2030 "Battle of Fredericksburg, Virginia" Gallery Wrapped Canvas Print, 20" x 30"
Framed Art Print, 'Louisiana Heron, from'Birds of America, engraved by Robert Havell, 1834' by John James Audubon: Outer Size 25 x 22"
iCanvasART BNK84-1PC3-12x8 Icanvas Mobile Lovers #3 Print by Banksy, 26" x 0.75" x 40"
Framed Art Print, 'Three Umpires' by Norman Rockwell: Outer Size 17 x 20"
Canvas Art Framed 'The Artist's Garden at Vetheuil, 1880' by Claude Monet: Outer Size 20 x 24"
DecorArts - The Kiss, by Gustav Klimt. Giclee Print& Museum Quality Framed Art for Wall Decor. 24x30", Frame size: 30x36"